William Lyon Mackenzie, Toronto’s first mayor, was a humbug when it came to Christmas. The Scottish-born newspaper editor and politician would dock his employees a day’s pay for taking the holiday off. Hogmanay, a Scottish New Year’s Eve feast, was his celebration of choice, complete with bagpipes, shortbread, haggis and whisky. Boy, have things changed since 1834—nowadays Toronto has a magical multitude of things to enhance the holiday season. Decorative wooden sheds offer handmade ornaments, carvings and crafts, poutine, chocolates, Glühwein (mulled wine) and heated beer gardens. For children, there’s a Ferris wheel, a life-size gingerbread house and a carousel. The market is free on weekdays until 5 p.m. Friday. A $6 admission fee is charged on weekends. It’s closed Mondays, but area shops and restaurants are open seven days a week. The Cavalcade of Lights celebrated its 52nd year on Nov. 24 at Nathan Phillips Square with the lighting of one of Canada’s largest Christmas trees, a concert, fireworks and an outdoor skating party. The 525,000 LEDs will continue to shine as a huge Holiday Fair takes place Dec. 1-23 at this square in front of City Hall. The free fair is part Christmas crafts market and part winter carnival. Attractions include the ice rink (rent skates for $10), Holly Jolly Midway with a carousel, Santa visits, food truck morsels and fireside cocktails from an ice bar. Another artisan shopping extravaganza, the One of a Kind Christmas Show, continues until Dec. 2 in Enercare Centre at Exhibition Place. More than 800 designers offer handmade gifts, and artists teach do-it-yourself craft workshops to ticket holders in the Creative Lounge. Now in its 11th year, Winter Magic glistens at Yonge-Dundas Square. The festival opened Nov. 17 with the sparkle of a 40-foot sculptural light tree with 52,000 blue-and-white LEDs and a trio of 3-D polar bears. More lighting displays are suspended over Yonge Street, including LED banners, a 3-D sleigh with reindeer and illuminated flames atop Victorian lampposts. Since 1990, a dozen designers have decorated “trees” in artistically imaginative settings at the 12 Trees of Christmas exhibition in the Gardiner Museum of Ceramic Art, 111 Queen’s Park. Last year’s Yule delights included a disco-ball tree, a manually powered tree light show and a tree comprised of illuminated blocks. Adult tickets cost $15, seniors, $11, students, $9, and children, free. Half-price admission is offered 4 to 9 p.m. Fridays. A dozen illuminated art installations by 20 local artists are woven through the landscape in the free Winter Light Exhibition on the West Island of Ontario Place. Themes include illuminated water forms; a 12-foot freestanding icicle silo; and 150 birch trees covered in 180,000 fairy lights. Other free attractions include skating on a synthetic polymer ice rink and a weekend bonfire surrounded by log seating and Muskoka chairs. Seasonal topiary and 30 varieties of poinsettias fill six greenhouses at Allan Gardens Conservatory. In the Bloor-Yorkville cultural district, take in the decorations on Cumberland St. near Yorkville Park. Families can enjoy the glitzy animated storefronts of luxury brands like Holt Renfrew, Harry Rosen, Swarovski and Tiffany. Hudson’s Bay and Saks Fifth Avenue department stores are beaming with wondrous Christmas tableaux on Queen Street, too. Their windows were revealed in early November. Also don’t miss the giant glowing reindeer and the 100-foot red tree, covering three levels of the Eaton Centre shopping mall at 220 Yonge St.
For a “green” Christmas, try the Christmas Flower Show at Allan Gardens Conservatory. The free show opens Dec. 2 with horse and carriage rides, Santa visits, carolers and hot cider. Hours are 10 a.m. to 5 p.m. year-round with weekend candlelight tours until mid-January. Santa awaits young visitors during “A Nutcracker Christmas at the Castle” at Casa Loma, a real-life castle built in 1914. Casa Loma, a real-life castle built in 1914 with towers, turrets, a stable and secret passages, is regally decorated in December for “A Nutcracker Christmas at the Castle.” The 98 rooms of the venerable Gothic revivalist landmark are filled with 10 designer-decorated trees, Professor Wick’s Magic, Glisse on Ice skating show, Santa sessions, gingerbread and sugar cookie decorating, carol singers and hot cocoa. Light sculptures and rainbow-colored floodlights coruscate the gardens, battlements and fountains. Adult admission is $27, youths and seniors, $22, and children, $17. “Christmas by Lamplight” is one of many Yule family events at Black Creek Pioneer Village. For hungry travelers, there’s a three-course Christmas dinner for $60 at Black Creek Pioneer Village, a restored 1860s hamlet with costumed townsfolk, farm animals and a working brewery. The menu includes butternut squash soup with maple crème fraiche, roasted turkey with stuffing and pumpkin pie with whipped cream served by candlelight on December weekends. Christmas by Lamplight includes evening home tours, caroling, ornament making and festive foods, bathed in the flickering glow of lanterns. Family Christmas Weekends provide tree trimming, wagon rides and old-fashioned treats like mincemeat tarts, roasted chestnuts and flaming plum pudding. Another historic site from that era is Mackenzie House, the last home of Toronto’s aforementioned first mayor. The three-story, 1859 brick row house—despite Mackenzie’s distaste for the holiday—hosts a Victorian Christmas Program. In the back of the Greek Revival home is an 1845 flatbed press, which prints cards for children to write gift wishes to Santa. Reflecting the times, rooms are sparsely dressed in greenery and the table is set for Christmas dinner. Guests are served warm biscuits and mulled cider in the kitchen, which is illuminated by gaslights. A Christmas Baking Workshop, using the 1850s kitchen stove and original recipes, is planned at 9:30 a.m. Dec. 8. Advance tickets cost $30. Costumed reenactors offer a Scottish New Year’s toast during a Hogmanay celebration at Gibson House Museum, an elegant 1851 farmhouse nestled between high-rise apartments. If you want a wee taste of Scottish food more to Mayor Mackenzie’s liking, sign up for a Hogmanay celebration at his home on Dec. 28 and 29. Musicians Gin Lane will perform and tickets cost $30. There are also two Scottish New Year’s dinners scheduled Dec. 29 and 30 at the Gibson House Museum, an elegant Georgian farmhouse built in 1851 for the Gibson family. Before dinner, a haggis is brought in on a platter, accompanied by bagpipe-playing storyteller Ian Bell. The oatmeal and meatloaf dish is served with a dram of Scotch whisky. A full dinner follows, at $65. As the evening closes, the costumed staff sings “Auld Lang Syne,” and Bell explains the custom of the “First Footer,” the first visitor of 2019, who brings coal, salt, silver or shortbread. 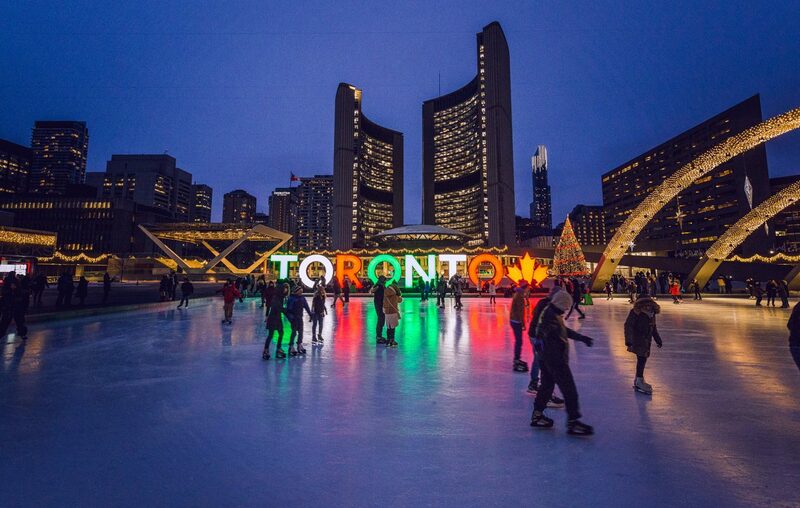 For more holiday activities, check out seetorontonow.com.